Tie Breaker Tournament – 12U Baseball – United States Specialty Sports Assoc. Join the Hopkinsville Parks and Recreation Division and Tie Breaker Park for their annual baseball and softball tournament. April 27 & 28 - 12U Baseball – United States Specialty Sports Assoc. 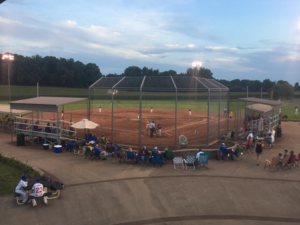 Tie Breaker Park Tournament – 12U Baseball/18U Girls Fast Pitch Softball – 3Up 3Down Events – United States Specialty Sports Assoc. Join the Hopkinsville Parks and Recreation Division and Tie Breaker Park for their annual baseball and softball tournament. May 4 & 5 - 12U Baseball/18U Girls Fast Pitch Softball – 3Up 3Down Events - United States Specialty Sports Assoc. Join the Hopkinsville Parks and Recreation Division and Tie Breaker Park for their annual baseball and softball tournament. May 11 & 12 - 12U Baseball/18U Girls Fast Pitch Softball – 3Up 3Down Events - United States Specialty Sports Assoc. Tie Breaker Park Tournament – 18U Girls Fast Pitch Softball – United States Fastpitch Assoc. Join the Hopkinsville Parks and Recreation Division and Tie Breaker Park for their annual baseball and softball tournament. May 25 & 26 - 18U Girls Fast Pitch Softball – United States Fastpitch Assoc. Tie Breaker Park Tournament – 13U Baseball – Baseball Players Assoc. Join the Hopkinsville Parks and Recreation Division and Tie Breaker Park for their annual baseball and softball tournament. June 8 & 9 - 13U Baseball – Baseball Players Assoc. 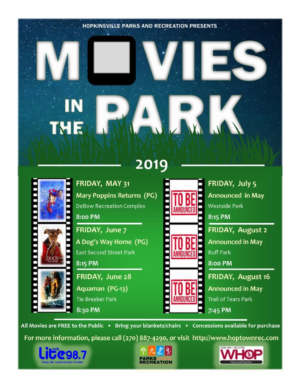 The City of Hopkinsville, Division of Parks and Recreation, will present the full-length feature film “Aquaman” on a Big Screen 35’ X 45’ in size, with stereo sound. The movie will be held outdoors at Tie Breaker Park, at 8:15pm. Admission is FREE! Cold drinks and popcorn will be available for purchase. Comfort station will be onsite. All showings begin at dusk. Bring your family and your lawn chairs or a blanket for a great evening of family entertainment. Tie Breaker Park Tournament – 12U Kentucky State All Star Baseball – United States Specialty Sports Assoc. Join the Hopkinsville Parks and Recreation Division and Tie Breaker Park for their annual baseball and softball tournament. July 13 & 14 - 12U Kentucky State All Star Baseball – United States Specialty Sports Assoc. 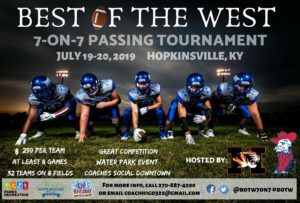 Join Hopkinsville Parks and Recreation Division and Tie Breaker Park for this inaugural football tournament! Make your plans to attend the MASSIVE 32-team event in July! Christian County High School and Hopkinsville High School are co-hosts. Tie Breaker Park Tournament – 18U Girls All Star Fast Pitch Softball – United States Sports Specialty Assoc. Join the Hopkinsville Parks and Recreation Division and Tie Breaker Park for their annual baseball and softball tournament. July 27 & 28 - 18U Girls All Star Fast Pitch Softball – United States Sports Specialty Assoc. Tie Breaker Park Tournament – 12U Baseball – United States Specialty Sports Assoc. Join the Hopkinsville Parks and Recreation Division and Tie Breaker Park for their annual baseball and softball tournament. 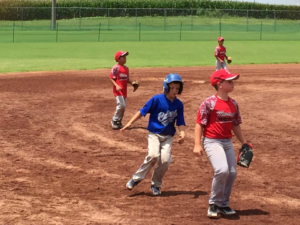 Aug. 10 & 11 - 12U Baseball – United States Specialty Sports Assoc. Sept. 21 & 22 – 12U Baseball – Baseball Players Assoc. Join the Hopkinsville Parks and Recreation Division and Tie Breaker Park for their annual baseball and softball tournament. Sept. 21 & 22 - 12U Baseball – Baseball Players Assoc. Tie Breaker Park Tournament – Men’s TPA World Slow Pitch Softball Tournament – The Player’s Assoc. Join the Hopkinsville Parks and Recreation Division and Tie Breaker Park for their annual baseball and softball tournament. Oct. 4 - 6 - Men’s TPA World Slow Pitch Softball Tournament – The Player’s Assoc.